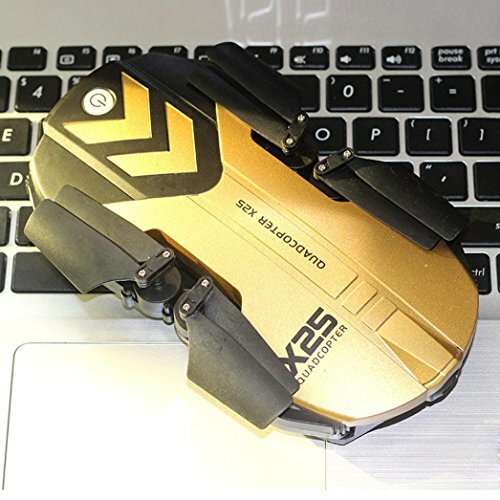 Made of the high-grade material, which is durable, wear-resisting, anti-corrosion and with good toughness,Altitude hold function provides stable flight, and enables the drone automatically lock height and hover to film out of the picture, more realistic colors, clearer picture, not miss any moments. The trajectory flight mode enables you to control the drone through drawing the trajectory that you want on the screen and the drone will follow the path that you drawn,HD camera with APP beauty function can record every unforgettable moment and make you be more beautiful. Headless mode allows you to ignore the direction of drone and to control the drone easily,3D rolling makes the quadcopter flip forward, backward, leftward, rightward according to your instruction. 2.4Ghz frequency provides stable signals, precise control, sensitive reaction and far remote control distance. Built-in positioning system, and the one press automatic return ensure that you can call back your quadcopter without any delay.